Should there be a second referendum (aka a ‘People’s Vote’) on Brexit, the Bishop of Oxford was asked. “My own view is that it would make things worse and it would open up the more fundamental questions again,” he responded forthrightly (and absolutely correctly). “The process of negotiation, which the Prime Minister is leading, is to try and find the right way of reconfiguring our relationship [with the EU] – that’s something the whole nation can coalesce around,” he expanded (without affirming the current draft ‘Withdrawal Agreement’ which contains one or two pitfalls). “It’s an immensely challenging task and I pray for her daily in it,” he added (which must have helped to guide No.10 in their rebuttal to those pitfalls). The Bishop of Liverpool is equally forthright that there should indeed be a second referendum (which is really a third ‘People’s Vote’ [the first being in 1975], but we’ll let that point of pedantry go). He doesn’t believe it would make things worse; on the contrary, a ‘People’s Vote’ now would usher in a new golden age of political stability, creativity, peace and prosperity. 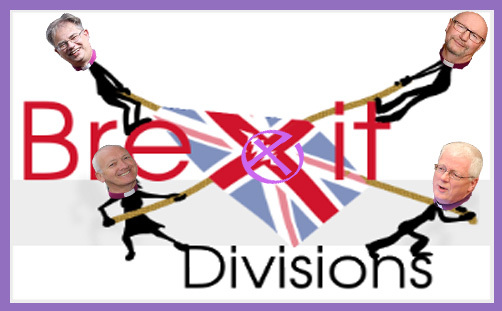 The nation’s present divisions would disappear overnight as all those belligerent Brexiteers would have their eyes pointed toward the light of the Remainer New Jerusalem which must be builded in England’s green and pleasant land (and Scotland’s, Wales’ and Northern Ireland’s) whatever it takes. He doesn’t tweet helpful or supportive prayers for the Prime Minister, preferring distinctly partisan barbs. The Bishop of Leeds agrees with the Bishop of Oxford: “The referendum result should stand,” he said, before adding ominously: “I don’t always like the outcome of a general election, but we live with it — until we get a chance in due course to choose something different”, which might be an allusion to the hope of a second referendum, or it might not; it’s hard to tell. But then he writes: “I can only see Brexit turning out to be bad for the country”, so he is clearly in search of a way to avert the impending disaster, and ‘Repent! Turn to God!’ is not his call to the nation. He makes lots of speeches (usually about hopelessness) in the House of Lords which seem to exhort reconciliation, but there’s an inescapable feeling of his storing up an ‘I told you so’ for the future: the sarcasm is palpable: “..only four months remain before we walk arm in arm to the sunlit uplands where the easiest deal in history will have been made..”. It isn’t his lack of sincerity or passion or knowledge that’s the problem; it’s just that Jesus never went around saying: “Ha! You Romans! You Jews!” You Samaritans! You Greeks! How on earth are you all going to live together? Where’s the narrative to heal your divisions? What do any of you have to offer as we go forward?”, did he? He showed them the inspirational path to peace and reconciliation, and he did so incarnationally. Marvellous, isn’t it? 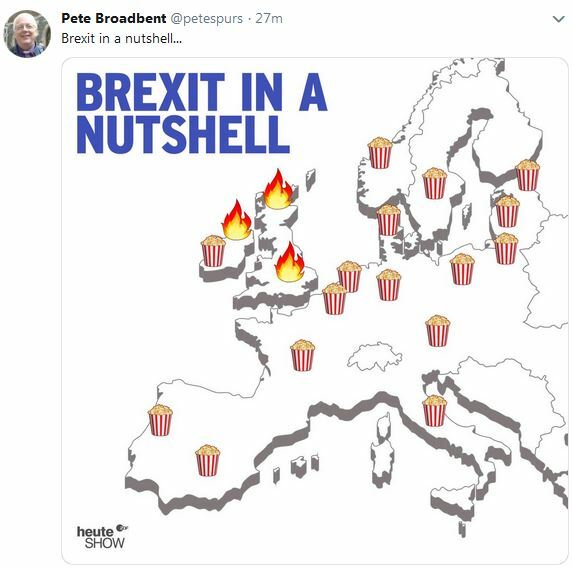 While the Holy Spirit descends with tongues of fire to bless the United Kingdom, there is much gorging of popcorn by the Irish and continentals, seemingly envious for the Lord who has set British hearts on fire for truth, liberty, justice and righteousness. But neither is the complexity of a further referendum a good way of dealing with the process at the end of negotiation. It will add to our divisions; it will deepen the bitterness. It is not democratic; it is unwise. And the Bishops of of Gloucester, London, Oxford, Truro, Winchester and Worcester all voted with him to repudiate the proposal. No bishop voted for a so-called ‘People’s Vote’, and yet some prominent episcopal voices continue to agitate for one (mainly via Twitter, though they may be alluding to it from their pulpits [“..as we prepare to leave the European Union? (Or not. Who knows?”)]). The Archbishop of Canterbury did once make a plea for a global and liberal, not to say Tiggerish kind of Brexit, but then Eeyore arrived, and his output switched to leitmotifs of Brexit-regret and a more Remain-inclined reconciling ecumenism. The upshot of all this is chaos and confusion; the schism of a divided soul. It is perhaps no wonder that, according to the latest ‘Veracity Index’, trust in clergy “is the only measure in clear decline (falling from 85% in 1983 and continuing to fall from 69% to 62% over the last two years). The Bishop of Leeds can opine for “a political vision that goes beyond economics and trade”, reminding us as again and again that ‘Without a vision the people perish‘ (Prov 29:18), by which he means ‘Without a vision there is division’ (not to mention “polarising aggression and its destructive reductionism”; “hopelessness, rejection and fear”; “lies, misrepresentation, manipulation and subterfuge”, etc., etc [he’s not a natural optimist]). But what is the Church of England’s unifying vision, exactly? Bishops can take a swipe at Theresa May (indeed, the entire Conservative Government), for their “repetition of mantras about a glorious future” which lack substance, reality or any remote credibility, but what is the Church of England saying to the nation beyond barbed partisan jibes and repeating mantras of reconciliation, healing, truth and trust? Now it may be, of course, that all the bickering bishops agree with every word that the Bishop of Kensington wrote. But they never tweet anything like it. Nor are their public-political speeches inclined to restorative visions of unity: it’s as though the chief shepherds of the Bride of Christ prefer to nag politicians like dripping taps more than they care to radiate the mystery hidden for the ages but now made manifest to the saints (Col 1:26). Bishop Graham Tomlin turns our eyes toward the transcendent: Brexit poses no obstacles at all to the Church’s essential mission of evangelism because it is a man-made political construct which will surely go the way of all preceding human constructs. It is the task of Bishops to be a focus for unity – especially for Christian unity – and to witness (incarnationally) into a divided and fragmented Europe (which, let’s be honest, has been rended since the Protestant Reformation). Accepting European plurality and societal division does not diminish the Church’s mission, but leads (or should lead) to the higher realisation that ‘My kingdom is not of this world‘ (Jn 13:36a), the fact of which Bishop Graham reminds us. The immutable revelation of God trumps the four indivisible freedoms of the European Union. Bishops who go on and on about the imperative of remaining part of it forge an abyss between half the nation and the Church: ‘if my kingdom were of this world, then would my servants fight…’ (13:36b). Fighting bishops are as detrimental to the witness of the Church as divided political parties are to their electoral chances in a general election. Don’t conflate Brexit with the struggle for the Kingdom.